The link between diabetes and oral health is sometimes forgotten in the management of the disease. 29 million Americans currently suffer from diabetes. Diabetes can be a manageable condition; however, there is a significant percentage that suffers from devastating comorbidities associated with the disease. While blindness, strokes and heart disease are sometimes the most commonly thought of diabetes can cause significant oral health problems. Research has shown there is an increased likelihood of gum disease as well as significant gum disease in those who have diabetes. In addition, serious gum disease has been shown to affect blood glucose control –which can be incredibly dangerous for diabetics. Blood glucose that is left unchecked can speed up the progression of diabetes. The key to the management of both Type 1 and Type 2 diabetes is blood sugar control. As sugar levels rise there is an increased risk of numerous oral diseases. The first is tooth decay that can lead to cavities. A healthy mouth contains various types of bacteria – not all that is harmful. Sugar in food interacts with the bacteria and causes plaque on your teeth. The acid in plaque then attacks the teeth and if left on the teeth will lead to cavities. Increased blood sugar is commonly associated with an excess of sugar and starch that increases the acids which erode teeth. Gingivitis is another complication that can occur as a result of diabetes, and is a common and many times mild form of gum disease. It can cause irritation, redness, and swollen gums. The reason diabetics are more likely to get an oral disease – like gingivitis – is due to their increased susceptibility to bacterial infection. Once they get an infection, their ability to fight it off is impaired. In addition, if plaque isn’t regularly removed with daily brushing and flossing, it will harden along the gumline and result in tartar. The tartar will then irritate the gums and can result in gingivitis. If gingivitis is not properly addresses it can lead to serious gum diseases called periodontitis. This serious infection can destroy soft tissue and the bones which support teeth. If left untreated, the gums and jawbone can pull away from the teeth eventually leading to tooth loss. Once again, this occurs due to a diabetic’s impaired ability to fight off an infection. In some instances, periodontitis can also cause blood sugar to rise. This makes controlling overall blood sugar more difficult. Proper dental care targeted at preventing damage to the teeth and gums is essential for everyone, but must be taken even more seriously by those with diabetes. In order to protect your teeth, and health in general, a diabetic must make a commitment to manage their diabetes and work with their health team. Keeping blood sugar in check is the number one thing that must be addressed. Not only will consistent blood glucose levels protect teeth and gums, it will also protect blood vessels, eyes and kidneys. Brushing your teeth twice a day – ideally in the morning and night and after any midday snacks – is advised. Soft-bristled toothbrushes are best for protecting sensitive gums as well as cautious brushing that avoids too much pressure or hard scrubbing. In addition to brushing, daily flossing is also essential. Finally, scheduling regular check-ups with your dentist will help to protect your teeth and gums. When at the dentist, it is important to let your dentist knows that you have diabetes. Many dentists will be open to having a relationship with other health care providers that are involved in diabetic care. 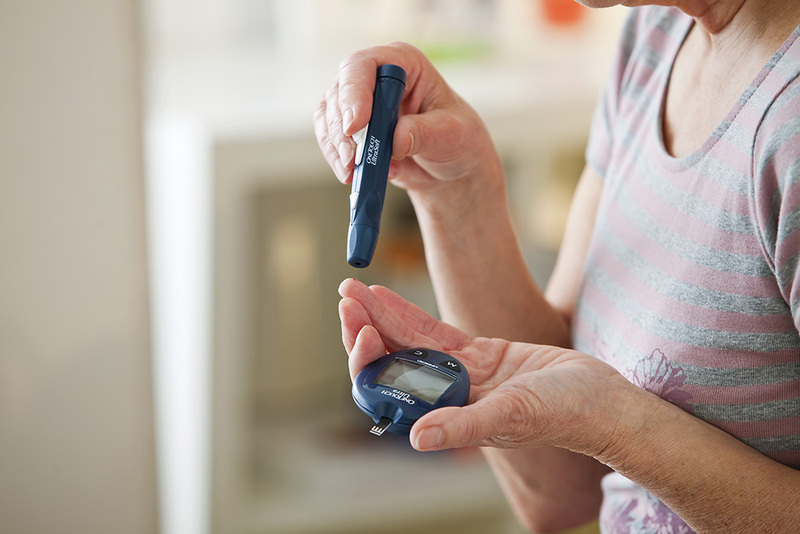 Managing diabetes is a lifelong commitment and includes support from both medical and dental providers. Ensuring blood glucose levels are kept in check will prevent many of the comorbidities that occur due to the disease. Poor oral health doesn’t have to be a result of diabetes. A healthy body and mouth is essential to disease management.